Friday, September 27 : 4.00 p.m. - 6.00 p.m.
Saturday, September 28 : 12 noon - 4.00 p.m.
Sunday, September 29 : 2.00 p.m. - 4.00 p.m.
Dorothy Cross, born 1956 in Cork, works in a variety of media including sculpture, photography, and video. Her first major solo shows were 'Ebb' at the Douglas Hyde Gallery, Dublin, in 1988 and 'Powerhouse' at the ICA, Philadelphia, the Hyde Gallery and Camden Arts Centre, London, in 1991. Cross represented Ireland at the 1993 Venice Biennale and a major retrospective of Cross’s work took place at the Irish Museum of Modern Art, Dublin in 2005. 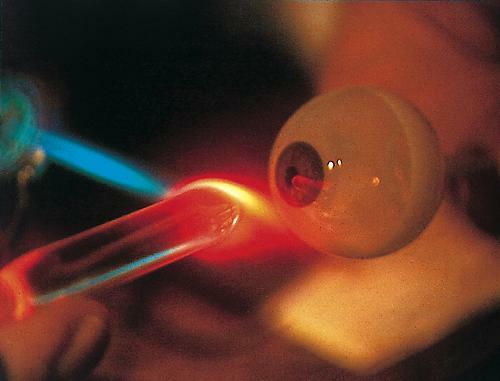 EYEMAKER is a video of Mr Jost Haas, one of the last glass-eye makers. Mr Haas was trained in Germany and has spent most of his life making prosthetic eyes in England. Eye prosthetics are now made from plastic, so his skills will soon disappear. Dorothy asked Mr Haas to allow her to film him fabricate a glass eye, and when complete, to blow it up – burst it like a bubble - destroy it. In the last seconds of the video he blows the eye, the bubble pops and disappears - one could miss it in the blink of an eye. Mr Haas has the expertise to copy an existing eye perfectly, down to the finest detail of a lost eye. His skill is wonderful. He creates the eye with extraordinary rhythm and grace. One big difference between a plastic eye and a glass eye is that tears run more beautifully over glass. The mimicry of the eye being made parallels art - the creation of illusion and artifact. In the end of EYEMAKER the explosion of the fake organ of vision foils us.